Time for this months skincare sunday, woo hoo! Can you tell how exciting my life is that I'm actually getting excited to talk about skincare? Right, okay let's move on. This month I thought I'd talk about a staple product of mine that I use a couple of times a fortnight when I'm having a pamper evening or to give my skin a bit of a pick me up! 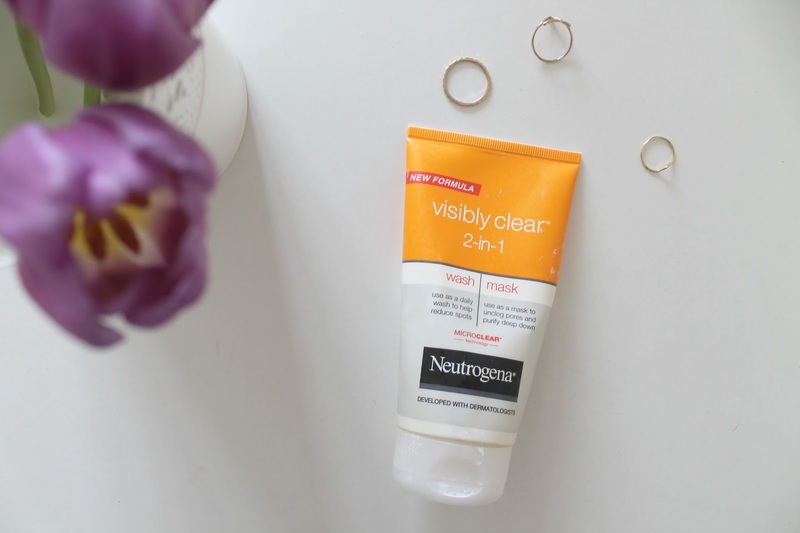 If my skin is going through a particuarly bad patch then I will definitely reach for this Neutrogena Visibly Clear 2 in 1 wash and mask to help clear up any spots or redness. Something about the smell and consistency of this product makes me come back to it again and again because it's just SO easy to apply! The product itself is a kind of hybrid between a wash and a mask so you can wash it off straight away for a more simple and quick skin refresh or leave it on for longer as a face mask to give your skin a deeper more nourishing cleanse. I only really use this product as a mask because I feel like I have other washes and cleansers that are a bit more effective but I would definitely recommend this is you're looking for an affordable face mask to give your skin a treat every now and then! I usually apply the mask when I'm in the bath so that not only does it have time to really work but also so that the heat from the bath can help open my pores and give my skin a little TLC. The only fault I have with the Neutrogena visibly clear mask is that it is a little difficult to wash off and does need a bit of extra muslin cloth washing to completely remove it from your skin but overall I definitely think the improvement I can see in my skins look after this outweighs any negatives!Neutrogena is such an affordable brand and as it's from the drugstore it should be really easy to get hold of for most of you! If you're looking for a slightly cheaper alternative to the more expensive masks out there then this is definitely the one.